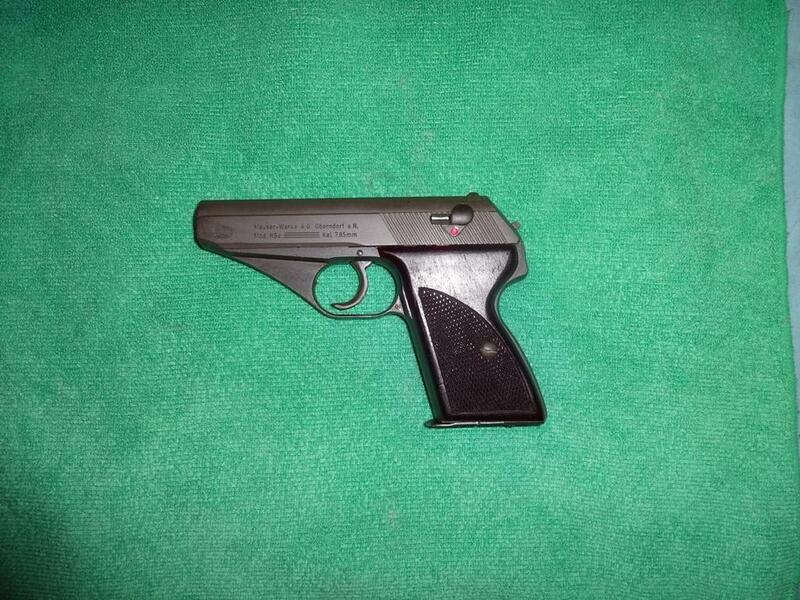 From May of 1945 to June of 1946 the French had control of the Mauser-Werke plant and produced 19,300 HSc pistols. The serial numbers range from 951 940 to 971 239. These pistols will have the "WR" acceptance stamp on them. The first 4,704 were assembled using parts in stock left over from the German control. The next 14,596 were manufactured using new supplies that the French brought in. These guns were produced for the French Indochina war. When the French moved in the plant they obviously didn't follow the status quo. If you compare the French made HSc (Sn 956 644 thru 971 239) with German made during the war years you will find a big difference in quality and workmanship. The French, for that one year, may have made a better quality HSc then most of the ones the Germans made during the war. During the war years the plant didn't have ALL of the same personal, operational procedures, RAW stock etc. So there were runs where quality was indifferent. The magazine is one example of improvements that were made. The French HSc mags with the half moon bottom plate were made with better steel (close grain). 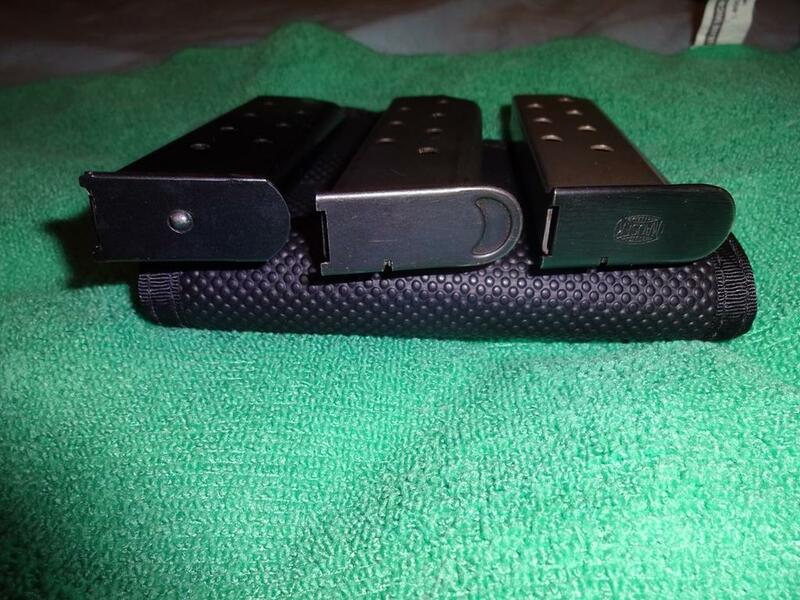 The half moon rib reinforcement was added to give the bottom plate support when using the mag to field strip the barrel from the slide and better leverage for mag removal in the field. 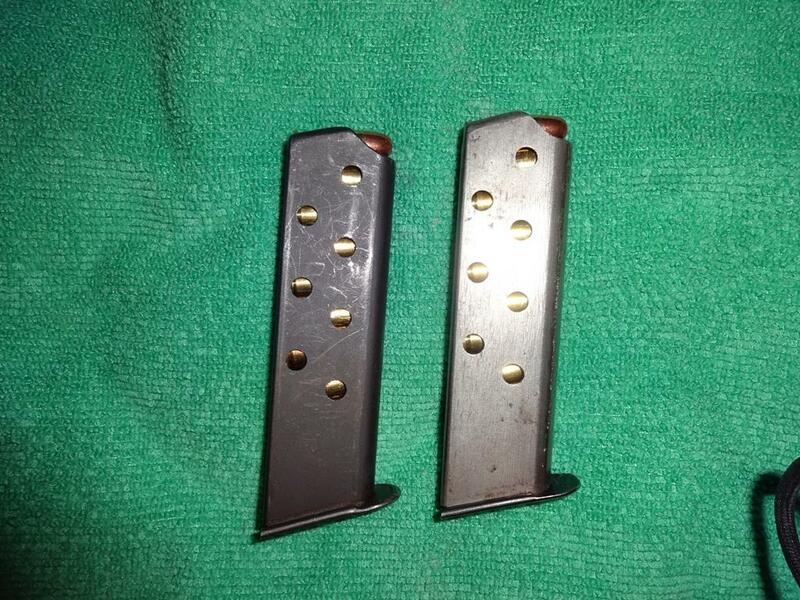 When you see a "war years" (MAUSER) stamped mag with the flat bottom plate and it is slightly bent up, it was probably used to remove the barrel from the slide during field stripping. When writing about the " Post war" HSc most articles refer to 1968 thru 1977 vintage and skip the French production all together but the true Post war HSc were the ones made by the French May 1945 thru June 1946. They also added a lanyard ring to the bottom of the frame. The French HSc pistols are an interesting bunch, the late war versions as well. There was a time of uncertainty between april and may 1945 and it shows in the products. Final military accepted HSc's show sloppy workmanship and hastily applied acceptance stamps, sometimes upside down. Then there is the small group of HSc pistols that left the factory unproofed, before the French administration brought things back into control. The French HSc's can be found with and without the lanyard loop. Pictures is a French HSc with lanyard loop and the 1970s Interarms sales box. That is a handsome pistol! Love the condition. Thanks, the box is numbered to the pistol, which is a nice bonus. The box is numbered to the pistol. That is really special. Congratulations. This one is just about in the middle of their production run. (in the 96xxxx) Just about every piece of this HSc was phosphated and the finish has held up well. I have had it for 38 years. Very nice shooter! Here are the two mags side by side. made mag with the half moon rib. The third on the left well that's one of those aftermarket mags that only hold 7. I can rework the aftermarket mag to hold 8. "There were three major magazine types used throughout production: the earliest ones (1940 to 1942) had a machined follower and flat bottom or floorplate stamped with the Mauser banner (trademark) on it; the banner was subsequently discontinued leaving just a plain, flat floorplate; and the final type (1943 to 1945) had a machined or stamped follower and blank sheet metal floorplate that was indented near the front." And finally: "Finger extension magazines were offered as an option for the HSc. These used the standard magazine housings fitted with a special 2-piece blued sheet metal floorplate assembly that extended the pistol grip length."